Open innovation in federal initiatives is intended to help address complex challenges by engaging with the public to harness ideas and expertise outside government. In its work with NASA, ECAST created deliberative forums where citizens could express their views on planetary defense and space exploration. By learning about and discussing NASA’s Asteroid Initiative, citizens provided informed perspectives on the complex tradeoffs regarding the costs, risks, and benefits of various policy options. 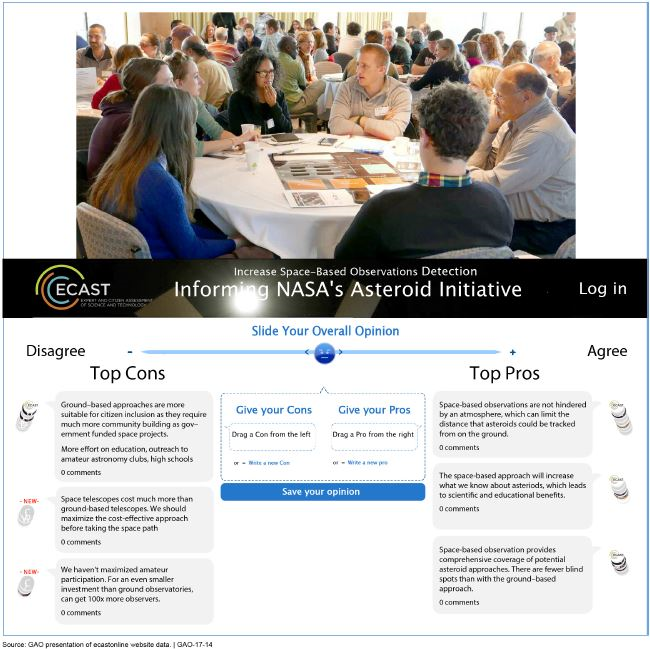 According to the GAO report, “NASA officials used this input to inform … decisions about its future mission and technology investment goals.” These forums “provided NASA with insights into public understanding and views on NASA’s asteroid work.” Because the project engaged non-experts, who are representative of the general population but are generally underrepresented in technology-related policymaking, these forums offered citizen perspectives that government decision makers would not otherwise have. ECAST has been a leader in bringing citizen views and values into the policymaking process. The ECAST network is led by Arizona State University’s Consortium for Science, Policy & Outcomes and partners with the Museum of Science, Boston, SciStarter, and The Loka Institute. The GAO report is an important validation of the tools and methods that ECAST has developed. As it continues to work with federal agencies, including the National Oceanic and Atmospheric Administration, the Department of Energy, and the Environmental Protection Agency, ECAST is building on the lessons and best practices for citizen engagement highlighted in the GAO report.